In Washington the halibut season is short lived and when you have limited opportunities to target them having good bait is a must. There are several rigging presentations and baits that have been standbys for decades. When it comes to bait, you have several options, namely octopus, squid, horse herring, salmon and tuna bellies, etc. Meanwhile, in my opinion, rainbow trout is one of the best halibut baits that is under-utilized. Most of our halibut fisheries are open in the spring, which is ironically when our lakes are planted with easy to catch rainbows. Catching trout is easy. Grab a couple jars of Pautzke Fire Bait or eggs and head to a local lake to catch a limit of halibut bait. You’ll be impressed with how much halibut like them. The great thing about using trout for halibut bait is that you don’t have to cure them right away and don’t need to clean them. Instead, freeze them and cure them a day or two before bottom fishing. If fresh the trout is ready to be cured. When frozen let them thaw before starting the process. *One bottle of Fire Brine cures four-to-five trout. With all the ingredients in the tub mix thoroughly. If there’s Fire Power floating on the top of the brine you need to mix more. Your brine is ready for the trout. Prior to putting the trout into the brine make three cuts into each side of the trout. Don’t cut all the way through, rather only enough to open the flesh to let the cure, salt and color in. The incisions also allow the scent and oils to release when the trout is banging along the bottom of the ocean. That scent trail and the chartreuse grab the halibut’s attention. It’s time to brine. Place the trout in the container and let it sit for a day before flipping the trout over. This ensures the trout is evenly cured. Let them cure for two to three days in the refrigerator prior to fishing them. The trout will be firm and hold together well. Your bait now has a tremendous amount of chartreuse color, especially on the white belly. The bait packs a tremendous amount of UV, as you’ll see in this photo. 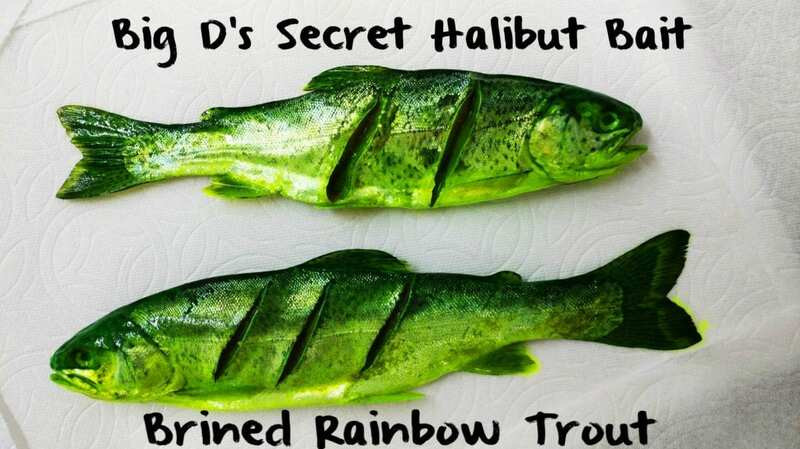 Rainbow trout for halibut bait? Absolutely. Give it a try. I’m positive you’ll be pleased with the results. 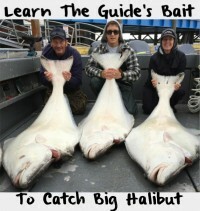 Editor’s Note: Rainbow trout isn’t a legal bait in all areas halibut are found. Consult local regulations to see if it’s legal where you fish. Big D – Duane Inglin – is the host of Seattle’s Northwest Wild Country radio. He can be heard Saturday mornings on KJR.